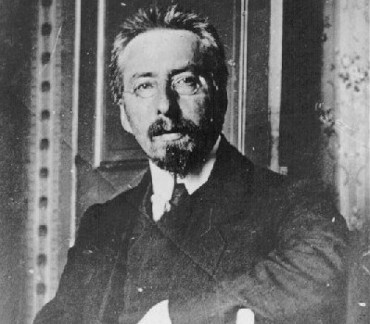 Vladimir Burtsev was a revolutionary activist, scholar, publisher and editor of several Russian language periodicals. He became famous by exposing a great number of agents provocateurs, notably Yevno Azef in 1908. Because of his own revolutionary activities and his harsh criticism of the imperial regime, including personal criticism of emperor Nicholas II, he was imprisoned several times in various European countries. In the course of his life, Burtsev fought oppressive policies from Tsarism in Imperial Russia, followed by the Bolsheviks and later Adolf Hitler's National Socialism. russischer Revolutionär (1862-1942). 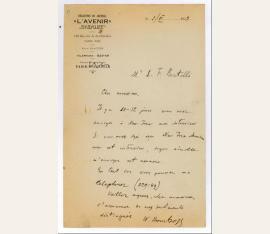 Autograph letter signed ("W. Bourtzeff"). [Paris]. 1 S. Gr.-8vo. 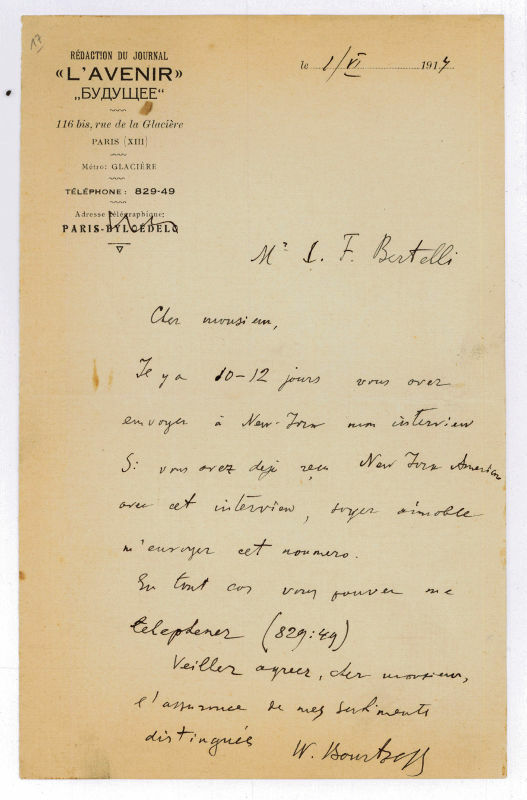 To F. Bertelli, requesting a copy of the "New York American avec cet interview". - Due to his widely ranging personal contacts, Vladimir Bourtzeff managed to expose numerous Russian spies and agents provocateurs. "In Chicago I had the opportunity of meeting the famous Russian revolutionary Vladimir Bourtzeff. I was greatly interested in his recital of the arduous mission that had come to him of unmasking Azeff as a police spy. Azeff was undoubtedly a most exceptional phenomenon in revolutionary annals. Not that there had not been before, or since, traitors in revolutionary ranks. But Azeff was no ordinary spy, and even today the psychology of the man remains an unsolved enigma. For years he had not only been a member of the Fighting Organization of the Socialist-Revolutionary Party of Russia, but also the all-powerful head of that terrorist body. He had planned and had successfully executed numerous acts against the highest dignitaries of the Tsarist Government, and he enjoyed the absolute confidence of all his co-workers. When Bourtzeff charged Azeff, the ultra-terrorist, with being an agent of the Russian Secret Service, even the nearest friends of the accuser thought him demented. The mere suggestion of such a possibility was considered treason to the revolution, for Azeff personified the very spirit of the Russian revolutionary movement. Bourtzeff, however, was a man of dogged tenacity who possessed an unerring intuition in such matters. He had exposed a number of spies previously, and his sources of information had always proved to be entirely reliable. Yet even he underwent a long inner struggle before he could bring himself to believe in the guilt of the trusted head of the Fighting Organization The data Bourtzeff secured were incontrovertible and damned Azeff as a man who had during a period of twenty years managed to dupe the Russian Secret Service and the revolutionists at the same time. Bourtzeff succeeded in proving Azeff a traitor to both sides, and both resolved to punish Azeff by death for his monumental deceit. Yet even at the eleventh hour Azeff tricked them, by escaping without leaving a trace" (Emma Goldman: Living My Life. 1931, Kapitel 38). - On headed stationery; some browning and brownstaining..